One of the things I think is unfortunate is the immediate dismissal of milk chocolate by some chocolate aficionados as too sweet, too adulterated and just not good enough. I love milk chocolate. That sweet treat is sometimes just what I need to make it through a day and so it is always with a bit of relish that I turn to the bars in my handbag at around 11am and 3pm. 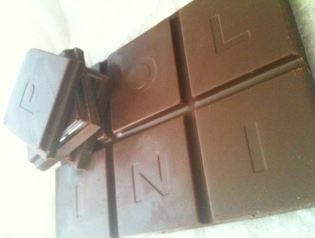 These two bars were part of a large box I was given by Pierre Marcolini when I visited the factory. They were awesome hosts and taught me a lot about what it was that they did at the factory. It was extremely illuminating and I saw exactly how they go from bean to bar in their industrial space with their massive machines that do all elements of the process. Java Milk Chocolate – At 50% this is a darker shade of milk chocolate. The additional fat has changed the flavours slightly and really made that spiciness take a bit more of a back seat. It isn’t as sticky as some of the other milk chocolates I have had and the single origin means this actually has quite a complex flavour. It has many layers you go through from something almost like yellow fruit, through the sweet middle as it melts down and you get through to a mild chocolaty finish. I don’t get the red berries myself but that could do with the time of day or what I had to eat earlier and the time of the year as it is still a bit chilly so it perhaps isn’t melting as quickly but this is an amazing milk chocolate and it doesn’t taste 50% at all. I think if you’re looking to treat someone who hates dark chocolate but wants something of a higher quality, this is a wonderful bar to use to help convert them. 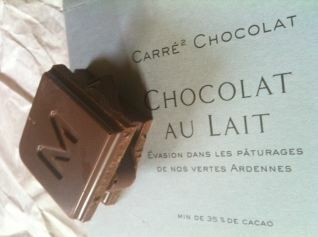 Chocolat Au Lait – this milk chocolate is what I’d consider a typical milk chocolate. At 35% this is a softer flavour in milk chocolate and is going to be the one the kids reach for. To me, this is edging into Cadbury territory as it is so sweet with so few cocoa solids and not as much of a flavour profile as to make it less unique however don’t let what I think detract you from trying it. Everyone likes something different and some folk like sweet without the funny challenging flavours. If you want a milk chocolate that does not use palm oil and does not contribute to deforestation and treats farmers fairly then this is going to be one of your better options. I, of course, know that many other bean to bar manufacturers like Divine but Pierre Marcolini is the only one in Belgium that you’ll be able to access easily and know he’s using his own beans and his own couverture and the highest quality possible in Belgium. All in all two really delightful milk chocolates. The Java is my favourite of the two but they both have merit and whether you’re in Belgium or looking for something a bit different, this is well worth the price!